07th July 2012, the final day was upon me and I woke today to more of the same affair. 06:30 start, eat breakfast, quick bike check and then out onto the road by 8am. I felt good today, tired but good, I had an early night and slept well, I think the fact this was the last day and the day was shorter only 85km (I say that like it’s nothing, but in comparison to the previous day this was a breeze) and only one major hill to worry about close to the starting point to get it out of the way early. The fact that in about 5 hours time I would be in Paris spurred me on. I started out easy, the roads leading out of Compiègne gave me 13 or so kilometres of lush easy tarmac, just a gentle effort and continual pace saw me clock up the distance rapidly. I fell into a group of about seven other riders and we all tucked in behind a welsh guy (I think his name was David) now out of the four days we had been cycling I had not really seen that much of David, I saw him a bit in Calais when we were riding in a convoy to the first sleep but not much more and as I sat behind him I began to understand why. David was a dedicated rider, you could tell because of his technique and pace, it was not excessively quick but very consistent, even up the first hill he pedalled away pushing the group ahead. He didn’t let anyone else take the lead, I guessed he was comfortable up front setting the pace, at a guess he must of been in his late 40’s maybe mid 50’s at most (sorry if that’s way off David) but he was an athlete, maybe the welsh hills had been giving him training for a while he just got his head down and rode, amazing to see and amazing to be behind. The first stop came quick, just a mere 19km in where we took on board water just outside of a large château. The pathways were less gravelly and more and more easy tarmac. I felt totally strong and was ready to continue at the pace that I was riding at during the morning. I knew there was no way I was going to keep up with David throughout the day so I let him go ahead, I may of felt strong but I had to keep my pace and not his. It all went by so quickly, cruising through pretty french villages taking the odd moment just to admire a church or scenery. Lunch was more of a brunch because most of us were there by about 11:30 . It was good to see almost everybody in one place, it was here that I learned that the guy I was riding with two days before (Chris) had been pulled out of the event. Like I said before he was a slower rider but I caught up with him and said he had been experiencing chest pains which the doctor diagnosed as angina. It was a little sad to see Chris pulled out at such a late stage but the last thing we all want is for someone to fall seriously ill so it was probably best they pulled him out. After brunch we had a 40-50km ride until we hit Paris. The goal a park about six kilometres away from the Eiffel tower. As I got closer and closer to the end I could feel the elation building it had been a fantastic trip and not without it’s difficulties. I think that the tricky bit’s of the ride will stick with me longer than anything else but all in all I got lucky, no punctures, the destroyed crank on the first day and a broken rear spoke that had not affected the bike at all. Of course the day was not over just yet and the heavens opened on me as I made my way towards Paris but nothing, not even the weather could stop me this day I was ready to finish this ride and I was actually singing on my bike whilst the rain fell soaking me through. As I hit traffic my London cycling nature came back to me quickly, I’ve never ridden in Parisian traffic before and it’s certainly not for the faint hearted, I found myself as a cyclist taking a very dominant position and checking everywhere for people turning into my lane, out of my lane, anything. There are parts when I thought that the whole things was madness and actually made me ever so slightly thankful for what London has (even though it needs improving) but I got through and I think cycling in London as long as I have helped a lot. Arriving at the park was a relief. No more crazy parisian traffic to deal with for a bit and a chance to relax a little. The overall mood was fantastic, people cheered as other riders came in and more so if the people had been having physical or mechanical problems. 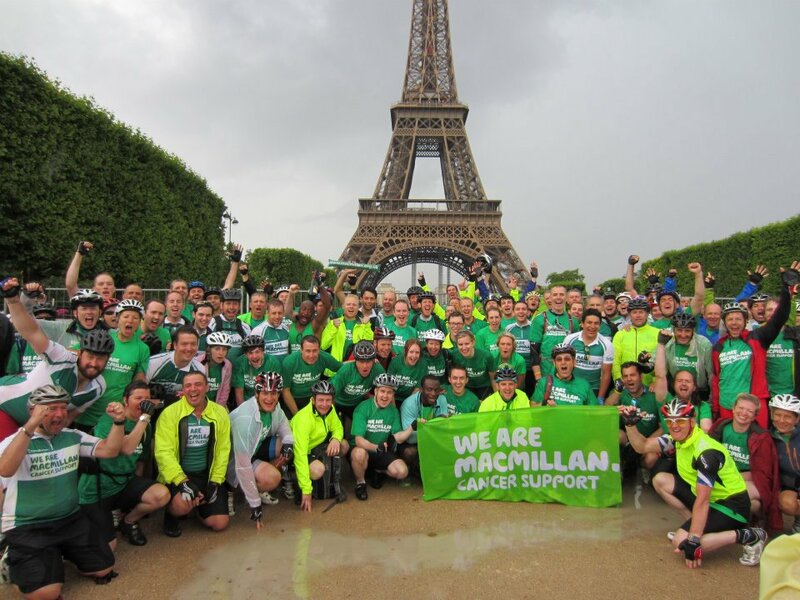 The last few,riders rolled in and we gave them a few minutes before we all set off in our green Macmillan shirts through the final streets towards the Eiffel Tower. Cruising up the Champs Élysée tourists and riders alike took photos. I rang my bell like a mad person on a bicycle and found out just how hard it is to get Parisians to smile. One French guy asked as we waited at some lights “Where have you come from?”, “London” I reply, All he could say was “Oh!”. Maybe he was lost for words? We cruised round the Arc de Triomphe which was truly a mad experience and just before we arrived at the Eiffel tower the heavens opened again. I think I went a bit mad at this point but I was there, I had achieved a great deal and all I could do was laugh and enjoy it. There was something slightly comical about the whole thing having just got dry from the previous soaking and the adrenaline flowing from the feeling of elation having finished this epic journey. A lot of people were at the tower, mostly friends and loved ones of the people on the ride with some people from Macmillan too there was cheering, tears and hugs with some very wet cyclists as we sorted ourselves out for a group photo. 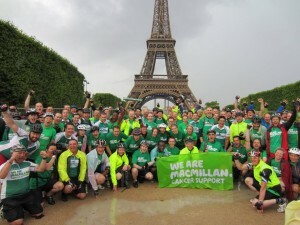 You can find all the photo’s I took on the last day on Flickr and Macmillan have a set up on their Facebook page I borrowed the big team photo from them.